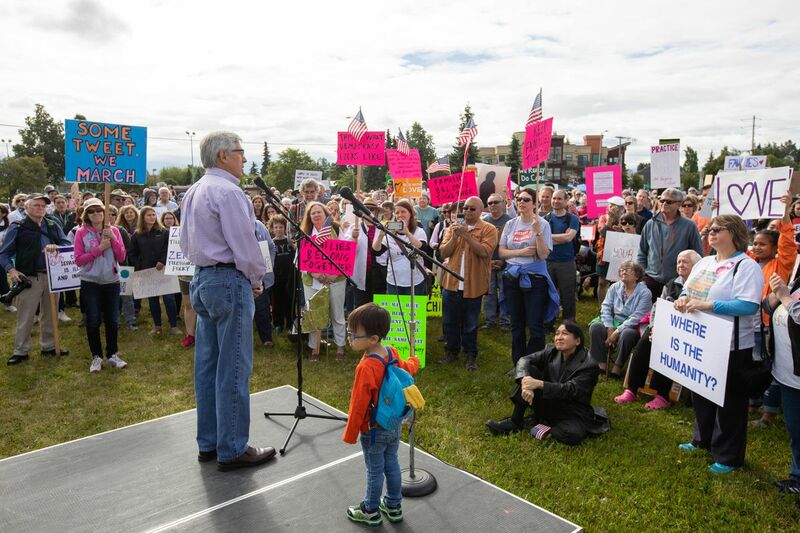 Hundreds of people gathered Saturday morning on the Delaney Park Strip in Anchorage, carrying signs and listening to speeches in protest of the separation of children from their families at the U.S.-Mexico border. The rally at West Ninth Avenue and E Street was part of a wave of protests happening nationwide on Saturday pushing back against the Trump administration's recent practice of splitting up immigrant families at the border. Some signs at the Anchorage march read: "Immigrants make America great," "Keep families together," and "Stop the Trump camps." After massive outcry over the family separations, Trump signed an order to end the practice that resulted from the "zero-tolerance policy" his administration implemented this year. Protesters Saturday expressed concern about the many children who have already been separated from their families. Michael Patterson, one of the organizers, said one goal of the rally was to show solidarity with Anchorage's immigrant community. 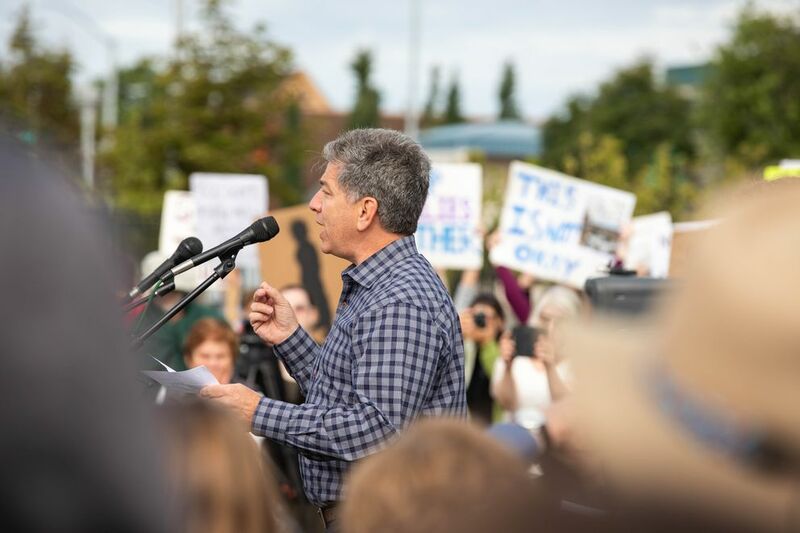 "I think it's important that — Anchorage in particular, because we are so diverse and you know, we have a history ourselves of doing this, especially with indigenous people," he said, referring to Alaska Native children being separated from their families and sent to boarding schools. Mayor Ethan Berkowitz, Lt. Gov. Byron Mallott and others gave speeches against the Trump administration's immigration policies. "Decisions have been made and actions taken that threaten our identity in an existential way," said Berkowitz. "But we who know history and who have lived it, we will not quietly go back into its dark places." Laura Norton-Cruz, who also attended the protest, called the family separations at the border a public health crisis and moral crisis. "What's happening at the border … creates toxic stress, creates the conditions that negatively shape children's brains and bodies," said Norton-Cruz. She works at the Alaska Resilience Initiative, which does work addressing childhood trauma. "Hopefully this is is a chance for people to look at our broken immigration system," said Trevor Bailly, who attended the rally with his family. "To make it easier for people to go through the immigration system … when it's their lives on the line." The rally speeches were at times interrupted by loud shouts from two anti-abortion protesters, who called the crowd "hypocrites" and held up abortion as a form of family separation. "There may be a modest, weak refrain of hate out there," Mallott said at the rally as those counter-protesters shouted, "but it ain't here."